Good morning. First off appologise for the delay with my August page of the Create your own calender, I will have it blogged today.Well Christmas is well and truly on its way isn't it. Halloween is over with, now just Bonfire night tonight then that's it, the official countdown to Christmas is on, well for a lot of people it is. For me the countdown to Christmas starts when The Xfactor starts. That's when i start to get everything organised. Its been very nippy here up in Scotland the past few days. It has been cold but its been really crisp all the way through the day. Had a lovely walk along the beach yesterday with DJ and i just sat on the rocks and looked out to the views of the never ending sea. So back to my post. I received the A4 self adhesive sparky acetate from Carol-Ann in the Stix2 offices last week. Its gorgeous and its shed free as people know i hate glitter, which is funny because i also ordered some of the glitters too. I couldn't resist as these glitters are so different, they are called See'd and Beed glitters. I thought i had to over come my annoyance of glitter and use them which i will over the coming samples. With this card i say i used the sparkly acetate. when using it with my dies, i thought it would be tricky to remove the backing cause of all the wee elements in the die cut but actually its not. Yes, if using dies you have to be patient when removing the backing sheet but the acetate it actually a good thickness and the backing removes quite easy from all the wee elements. The results really are spectacular irrelevant what kind of card or products to place the acetate onto. Its defo worth purchasing and trying it out. A4 Self adhesive Sparkly acetate sheet - S57303. 16mmx5m Wine Satin ribbon - S57216. Wine textured card - Bazzill Basics. 4mm White pearls - Mei Flower. 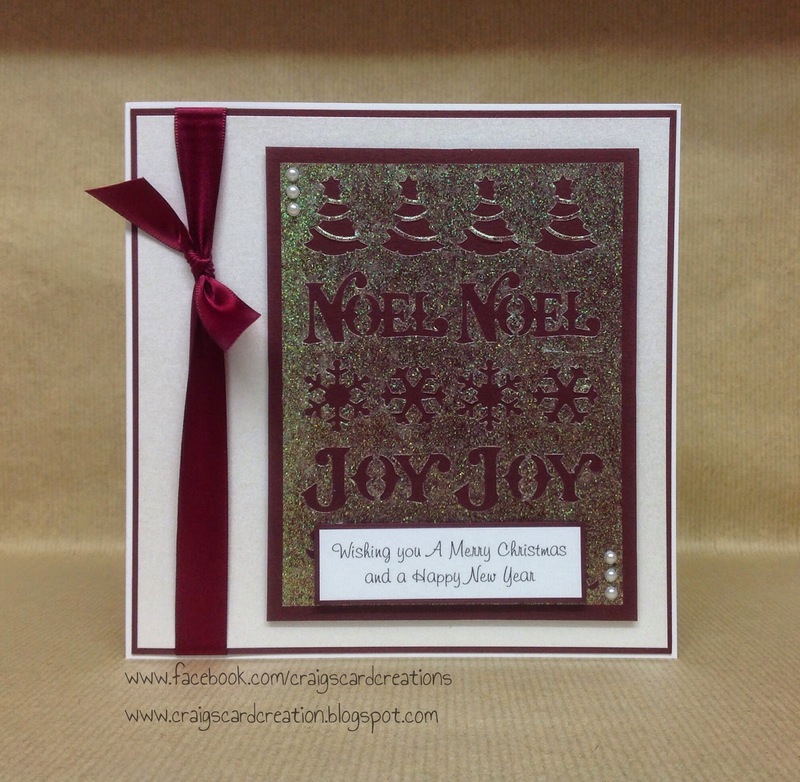 7x7 card blank - Craft UK. When removing the backing sheet off your Sparkly acetate. Don't remove it all at once. Remove the top first and stick onto your chosen area and slowly remove the backing sheet while ensuring there are no air bubbles left behind. Depending on what you are using, don't throw out the waste. As you can see from the die i have used, there is snowflakes, NOEL and JOY that are classed as the waste. Keep them and use them, these are also sparkly self adhesive elements. Make wee gift tags for your Christmas presents with these elements as the main focus point of your tag.